Johann Lamont said Scots would have to pay £75 each in transaction costs if a currency union with the rest of the UK didn't go ahead. 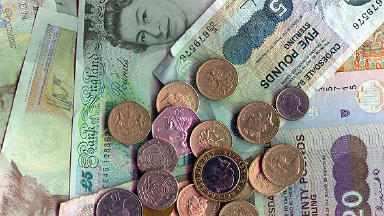 The cost of not having a currency union between an independent Scotland and the rest of the UK would be eight times higher north of the border, Labour leader Johann Lamont claimed. Ms Lamont said figures from the Scottish Parliament showed transaction costs resulting from having different currencies would amount to just £9 per person for those living in England, Wales and Northern Ireland. But she said the cost in Scotland would be eight times higher, at £75 a head. Ms Lamont told First Minister Alex Salmond there would be an "Alex Tax" that would be imposed on businesses in Scotland if there is a Yes vote in September's referendum. She attacked the SNP leader on the key issue of currency a week after UK Chancellor George Osborne, Labour shadow chancellor Ed Balls and Liberal Democrat Chief Secretary to the Treasury Danny Alexander joined forces to rule out a formal currency union with an independent Scotland. The Scottish Government has already said that would leave businesses in the remainder of the UK facing costs of £500 million a year to trade with Scotland - with Mr Salmond branding this the "George Tax". Ms Lamont said the First Minister, his deputy Nicola Sturgeon and Finance Secretary John Swinney had all "been repeatedly asked to put a figure on the transaction costs to Scottish business that will come with giving up the pound in the event of a Yes vote". While she said they had so far "refused to come up with an answer", the Labour leader added: "The Scottish Parliament information centre has come up with some numbers. Transaction costs for the rest of the UK, the so-called George Tax, work out at £9 per head for people in England, Wales and Northern Ireland. "But if the Scottish Government's own figures are to be believed, the cost in Scotland would be £75 a head - eight times greater." Ms Lamont then asked the First Minister: "Given this would be the consequence of his plan to break up the United Kingdom, why should Scottish business pay the Alex Tax?" But the First Minister hit back: "Our proposal is to share the pound and not have the transaction costs. "It is her proposal - that is Ed Balls's and George Osborne's proposal - to force Scotland into a different currency and impose transaction costs on Scottish and English business." He added: "The point that is being made by the Scottish Government is a reasonable one - I don't think English businesses will take kindly to be forced to pay the George or Johann Tax." 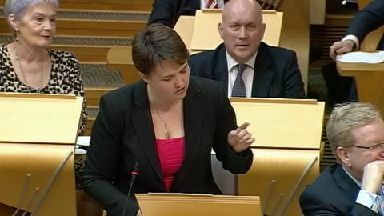 Mr Salmond went on: "I don't think that Johann Lamont wants to have her name attached to the same tax as George Osborne. "The Labour Party are struggling because of their association with the Conservative Party. The Labour Party have done themselves huge damage by associating with the Conservatives and in particular with George Osborne. "The reaction from the Scottish people to being told, instructed from upon high, that our currency, the currency that we jointly built up, doesn't belong to us, it belongs to George Osborne, I think is entirely understandable and will be deeply uncomfortable for the Labour Party in Scotland." Mr Salmond insisted that allowing Scotland to keep the pound in a currency union with the rest of the UK would be the "right thing" for both nations in the event of a Yes vote. Speaking at First Minister's Questions, he said this view had been endorsed by economics experts in the Scottish Government's Fiscal Commission Working Group. He went on to claim that if the rest of the UK would not share "assets" such as the Bank of England with an independent Scotland, it would then have to accept all of the UK debt - leaving every Scot £25,000 better off. "We've set out in the White Paper our proposal that we should share the assets and liabilities of the United Kingdom, we think that is the fair, responsible thing to do," Mr Salmond said. "And one of these assets is of course the Bank of England, which was nationalised in 1946. It is undoubtedly a public asset. We think that is a fair proposition to put forward." But he argued if the Treasury and UK Government believe they would be the continuing state if Scots voted for independence and as such would "keep all the assets of the UK", then "it follows as night follows day that they end up with liabilities". The First Minister said: "I don't believe we'll get to a situation where George Osborne wants to make every person in Scotland £25,000 richer, which is what would happen if the UK had to accept all of the national debt." Liberal Democrat leader Willie Rennie and Tory leader Ruth Davidson also criticised the First Minister's position on currency. 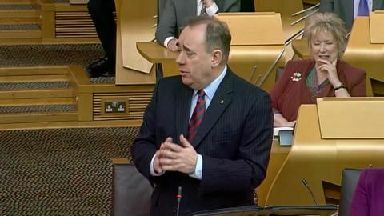 Mr Salmond is the "last man standing" in defence of the Scottish Government's plan, Mr Rennie said. 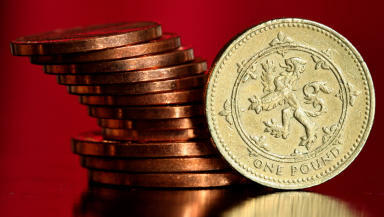 He called for a clear statement to Parliament that a Scottish currency is now an option. "Despite all the opinion, including on his side, he can't even say that it might be a possibility, and he can't hide on that until September," Mr Rennie said. "It will be the Chancellor after a Yes vote, if that were to happen, who he will have to convince about a currency union. "The First Minister's whole plan is based on the judgment of that Chancellor, George Osborne. And this is a man he derides for his judgment every day of the week. "The First Minister is gambling that Osborne will transform from his belligerent barbarian to his pacifist puppy - arch enemy to best buddy in a day." Mr Salmond repeated that the currency union is the best option, again warning that Scotland would be entitled to walk away from UK debt if its proposal is denied. "The Fiscal Commission working group set out a range of options for the currency of an independent Scotland - they said these options were viable given the strengths of the Scottish economy," Mr Salmond said. 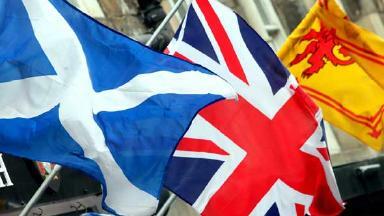 "They recommended the best option for Scotland and the rest of the UK was the currency union. We believe the currency union will be negotiated." Miss Davidson said all critics - including some campaigning for independence - are side-lined by Mr Salmond. "The First Minister may still be in denial but the rest of the country has woken up to the truth," she said. "Isn't this the week that we found out the emperor has no clothes?" The First Minister wants a "pick and mix" version of independence, she said. "On the currency he is weak, on pensions he is weak, on Europe he is weak, on the basic facts he is weak. He is weak, weak, weak. Isn't it true he is the man with no plan?" Mr Salmond reflected that a Nobel prize winner, Sir James Mirrlees, put forward the currency sharing plan and was name checked by Bank of England governor Mark Carney in a speech on currency unions last month. Scotlan Tonight discussed the latest developments in the independence campaign on Thursday with Scottish Sun editor Gordon Smart and the Daily Record's political editor David Clegg.